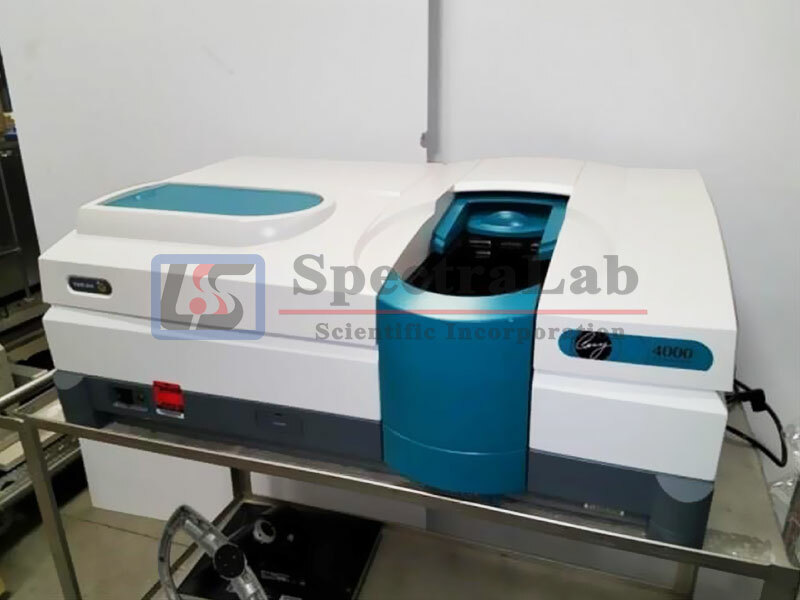 Varian Cary 4000 UV-Vis Spectrophotometer – Spectralab Scientific Inc. The one stop shop for all your analytical laboratory needs! The Cary 4000 is a high performance UV-visible spectrophotometer with excellent photometric performance in the 175-900 nm range, making it a powerful tool for analyzing biotechnology samples with minimal sample preparation. Controlled by the Cary WinUV software, a Windows-based modular software, it can be ordered with specific modules for bio and pharma. The UV-Visible spectrophotometer has a number of optional accessories for liquid samples like temperature control and multicell holders. A 90 day warranty is included. Since 2003 SpectraLab has been providing customers with special expertise on analytical equipment. We encourage you to contact us to speak with one of our expert and professional team members. Thanks for looking and we look forward to hearing from you! We always have considerable equipment inventory in stock to ensure you are supported. We have sufficient export experience, including professional packing and proper documentation. Please ask for free shipping if purchase value is good. If you are buying from the US we include customs fees, brokerage, and duties to make sure you have the same purchase experience as you would in the US. Handling, packing/crating is under our control in compliance with all countries' shipping codes (DDP: US Truckload or less than Truckload shipment only, DAP: All small package shipment, less than 60 lbs, DAT: International Truckload or less than truckload shipment only--door to accessible international airport only) and will be included in our Proforma invoice or Invoice. We will match prices with our competitors. We have longer warranties than our competitors. We have a professional team who will look after and support you, both before and after your purchase. We will provide you a complete solution with support, not just pieces of components.